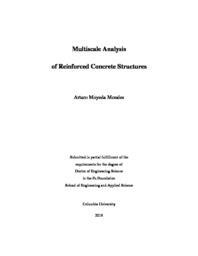 A multiscale approach, coined as the High Order Computational Continua (HC2), has been developed for efficient and accurate analysis and design of reinforced concrete structures. Unlike existing homogenization-like methods, the proposed multiscale approach is capable of handling large representative volume elements (RVE), i.e., the classical assumption of infinitesimally is no longer required, while possessing accuracy of direct numerical simulation (DNS) and the computational efficiency of classical homogenization methods. The multiscale beam and plate elements formulated using the proposed HC2 methodology can be easily incorporated into the existing reinforced concrete design practices. The salient features of the proposed formulation are: (i) the ability to consider large representative volume elements (RVE) characteristic to nonsolid beams,waffle and hollowcore slabs, (ii) versatility stemming from the ease of handling damage, prestressing, creep and shrinkage, and (iii) computational efficiency resulting from model reduction, combined with the damage law rescaling methods that yield simulation results nearly mesh-size independent. The multiscale formulation has been validated against experimental data for rectangular beams, I beams, pretensioned beams, continuous posttension beams, solid slabs, prestressed hollowcore slabs and waffle slabs.